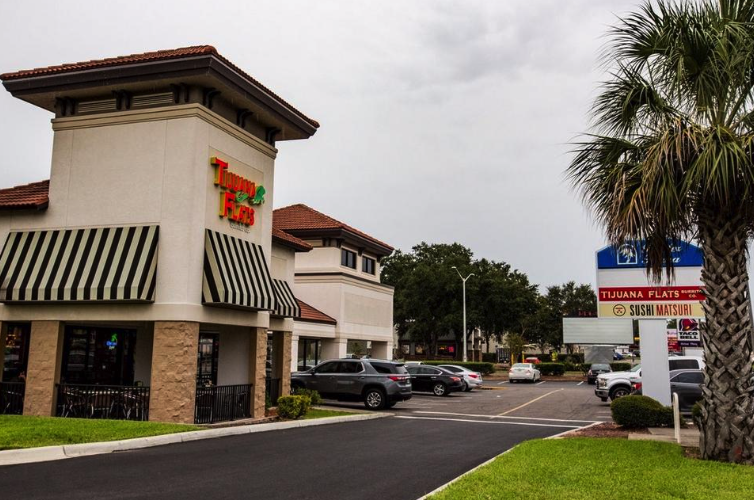 A Butler Plaza building off Archer Road that holds Tijuana Flats, a Hungry Howie’s and Sushi Matsuri will soon be demolished, putting its tenants on the move to other Butler Enterprises’ locations, officials said Friday. City permits show that Tijuana Flats will move from its spot on Archer Road to Butler North, on the corner of Windmeadows Boulevard and Clark Butler Boulevard. It will be on the corner of a strip that holds Orange Theory and Jimmy John’s. The Sun previously reported that Hungry Howies would be moving into the old Smoothie King spot, and Sushi Matsuri will be moving to previous The Village Jeweler spot near Target. Mary Reichardt, Butler Enterprises’ director of marketing, confirmed the restaurants were shifting spots in a text message. “We are very excited Tijuana Flats will soon begin construction on their new prototype design restaurant,” Reichardt said. The dated strip that holds all the restaurants and the previously closed Mattress Firm will be demolished and paved over to add more parking to Butler Town Center as the area continues to transform and more tenants move in. It will also clear a sight line into Butler Town Center as people drive southwest down Archer Road, she said. A timeline on the building’s demolition was unavailable and a permit for its demolition hadn’t been filed as of Monday. Lori Chakhtoura, Tijuana Flats’ area marketing coordinator, confirmed the restaurant has plans to move but could not give a timeline, saying the company is still working to iron out details. The demolition of one of the older Butler Plaza buildings is another step in the Butler Town Center transformation. Its next openings, Reichardt said, will include the new Noire Nail Bar and Pink Narcissus, which will move from its spot near Zaxby’s into the walkable town center. Recent openings include The Village Jeweler, European Wax Center and Hearth & Heart. Reichardt said Irish 31, an Irish restaurant, was expected to open in March but its opening has been delayed due its efforts to open a location in Sarasota.